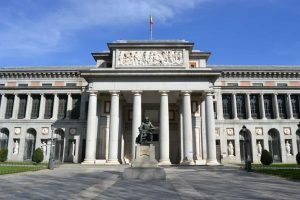 Since it’s inauguration in 1819 and throughout its centenary history, the Prado National Museum has fulfilled its important mission of preserving, displaying and enriching collections and works of art closely linked to the history of Spain, and they constitute some of the highest manifestations of artistic expression of recognized universal value. Its main attraction lies in the works of Velázquez, El Greco, Goya (the most widely represented artist in the museum), Titian, Rubens and Bosco (with the best and most extensive collections in the world), to which can be added paintings from artists as important as Murillo, Ribera, Zurbarán, Rafael, Veronese, Tintoretto, Van Dyck and Poussin, to name the most significant. Such cultural and artistic heritage requires adequate protection. Moisture affects organic materials more than the temperature. The canvas, oil and wood used as part of the works can be greatly damaged if air humidity is too high or too low throughout the year. The main external loads are the exterior air ventilation for the influx of large numbers of visitors to the exhibitions. The main internal load is the moisture emitted by this public. Both loads are highly variable and the air distribution in large open rooms makes it difficult to control the air humidity. FISAIR has worked with the consulting engineers for a number of years to modify the humidity conditions and has manufactured specific equipment. Inside the museum, you can find a large number of DIPHUSAIR series isothermal humidifiers and DF series desiccant rotor air dehumidifiers.